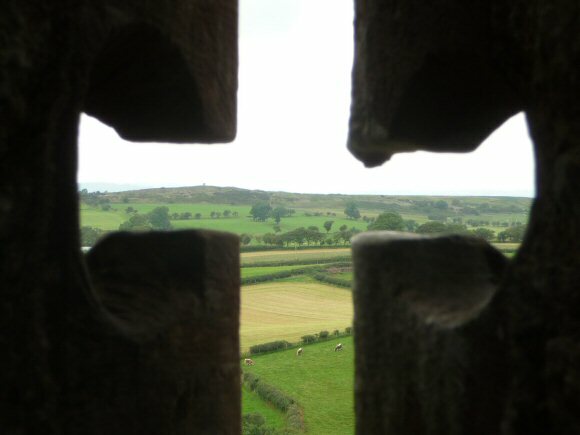 My photograph for 2010 was of a view of luscious green Welsh rolling fields seen though through a cross-shape carved stone aperture. It gives the impression of being a Christian cross appropriate for Christmas (and being the opposite foreground/background to that of a tombstone, which would have looked morbid) but actually it is just looking through the centre of an arrow slit. Arrow slits are defensive windows which were designed to be easier to shoot arrows out of than into. This one is in the ruins of Carreg Cennen Castle. An arrow slit is a narrow vertical slit which it is more difficult for arrows to be shot into than to be shot out of. They typically have a bevelled inner so that the archer inside can angle their arrow over a wide range horizontally and the long slit is vertical to allow the archer to shoot at different angles vertically (including steeply downwards). Most of the vertical slit is hidden in this view by framing the picture closely in on the centre. 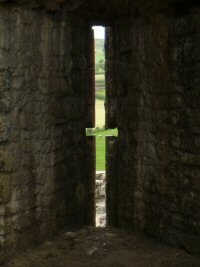 Some arrow slits, including this one, have an additional small slit horizontally to allow an wider view. The full shape of the arrow slit can be seen in the following wider angle photograph of it.